Twitter where we discovered that we are simpatico on some issues. When I sent a tweet out looking for interviewees for this endeavor, Sheatsy sent a DM to me, saying "...great interview with David, a true hero. I would love to turn the tables and interview you." I immediately knew that Carla (@Sheatsy) was a woman of valor. The hunt began, as I had to reactivate Facebook in order to complete my investigation. As I got what I was looking for, I quickly slipped back out the rabbit hole and back to my Tweetdeck. Here we go. Naomi: What makes you a Jewish capitalist with strong anarchist tendencies? Carla: Well, first and formost I am Jewish. Ethnically, culturally, and spiritually. There are those who will say they are Jewish and yet they do not support Israel or even celebrate Jewish holidays or mitzvot. I strive to incorporate Jewish thought into everything I do. Capitalism gives people the opportunity to be as successful as they can be, depending on how hard they work and how needed their service or product is. As Jews have been forbidden in the past from either working in a career of their own choice or owning their own businesses, I feel that the American Capitalist system is a true gift! I can work for someone else or open my own business. I can be fabulously wealthy or fail gloriously. The point is that we have the freedom of the opportunity, which is not granted so freely elsewhere in the world. Which leads me to the explanation of the Anarchist attraction. A lot of people confuse anarchy with "lack of order." This is an incorrect definition. Anarchism's goal according to Errico Malatesta is as follows: "we want Anarchism which is a society based on free and voluntary accord – a society in which no one can force his wishes on another and in which everyone can do as he pleases and together all will voluntarily contribute to the well-being of the community. But because of this Anarchism will not have definitively and universally triumphed until all men will not only not want to be commanded but will not want to command; nor will Anarchism have succeeded unless they will have understood the advantage of solidarity and know how to organise a plan of social life wherein there will no longer be traces of violence and imposition." In other words, a society free from government regulation and interference. In my opinion, I do believe we need a federal governement to provide a military to defend our country and to assist in aid if disaster should strike...and that's about it. I want to be left alone, I hate taxes, and I think that Thomas Paine, Ben Franklin, and our nation's other Masonic minded founders had it right. They must be rolling in their graves with what has been done with Constitutional law. Freedom from tyrannical government is a theme of Jewish history. So I guess you can say that my political and social beliefs reinforce my religious beliefs, and vice-versa. Naomi: Have you been finding like-minded folks on Twitter? Do you think meaningful friendships can be found there? Carla: I have been finding some like-minded folks, but I am so busy that I do not have much time to really utilize Twitter the way it's meant to be used. I think meaningful friendships are possible, if the effort is made to grow them outside of Twitter. Naomi: What is your gut feeling about David Appletree and The Jewish Internet Defense Force? Carla: David is Fierce and Strong. I trust him and his judgment. I feel almost a devoted obligation to help him as he is one of our present day heroes. And I have a bit of a crush I'll admit! Naomi: I love your Chai avatar. What does Chai mean to you? 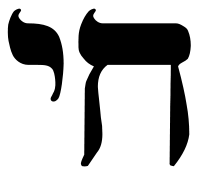 Carla: My Hebrew name is Chaya. Life is precious. I have had people try to convince me that Judaism "allows" for abortion. Perhaps if the mother's life is in danger, but I can't see any evidence of Judaism NOT being pro-life. I truly believe aborting an inconvenient pregnancy is murder and that my faith confirms it. Naomi: I saw that you have delved into your family history/ancestry. Can you tell what you discovered? Carla: Oh, my - far too much to answer here. Some highlights are the picture of the ship my grandfather Chaim emigrated to America on. I've traced my husband's family back over 300 years. It was said his maternal line was Jewish, but I've found no evidence of it. Naomi: A little birdie told me that you keep kosher. When I was a kid, we had a kosher butcher shop in our town that was like the Little Shop of Horrors. Would you like to say something about keeping kosher these days? Carla: Keeping kosher is easier than ever. I live in an area that only has one supermarket that carries kosher meat. It's 30 minutes away and it's very expensive. Solution: www.Allinkosher.com Also, read "Going Kosher in 30 Days" by Rabbi Zalman Goldstein. He makes it very easy to understand. Naomi: What is going on with the Whole Foods boycott? Carla: Sorry to say I don't think it's very effective. I think people need to start contacting Bravo's advertisers and let them know that they are possibly associating with Hamas and see how they feel about that. Naomi: How do you really feel about Facebook? As a mom of three, will you let your kids go on Facebook [if you can help it]? Carla: Facebook is a wonderful idea, but the people that run it are quite mad. I expect that it is a passing trend that will eventually be replaced by something better, safer, nicer. My kids do not have access to a computer without supervision, but I think facebook has a minimum age and they aren't old enough yet anyway. Naomi: How do you plan to teach your kids about the Holocaust? Carla: We have already read some books on the topic and discussed it on their level. We frequently talk about respect for other people even if they seem strange or different or have different customs than us. It all ties together. Naomi: Is there anything that you'd like to just get off your chest in regard to the current political administration's decision to increase troops to Afghanistan? Carla: Um...am I the only one who has noticed BHO's aversion to using the terms "victory" or "win?" He's not sending what the military has asked for. He is making them fight with one hand tied behind and an eye patch too! A great cause that I support is Operation Touch of Home. Check it out at www.Operationtouchofhome.com. Naomi: Thank you so much Carla, for being a guest on Conversations with Naomi! I'm looking forward to hearing more from you. Do you have a blog?